Take a virtual holiday house walk through seven different real-life homes, each decorated from top to bottom in a distinctly unique holiday style! Plus, gain tips and tricks for making this the best holiday ever. 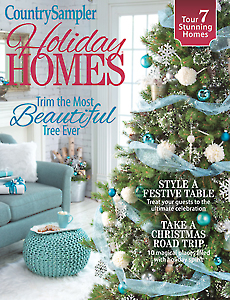 Enjoy holiday-decorated homes from traditional to country, farmhouse glam to cool blue and more. Follow our DIY tips to create any of the looks in your home. Discover the foundations of successful holiday decor from decorating with fresh greens to setting a stunning table. Celebrate Christmas spirit with delicious recipes beckoning back to Dickens' days. Visit one-of-a-kind holiday travel destinations to immerse yourself in the yuletide season. Plus much more! Looking forward to this new issue! !